This is not a pure tutorial, merely an informational document that represents my opinions only, and not those of Silicon Ice Development. It's not often I get to rant and call it an "informational" so here we go. 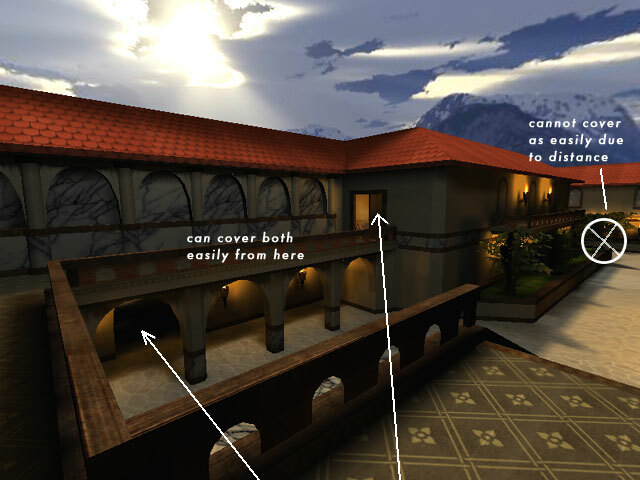 I'm going to discuss my thoughts on layout for Urban Terror maps. Right now (around beta 2.5 - 2/6) the two largest supported game modes (in terms of players) are Team Survivor (TS) and Capture the Flag (CTF). I will not be commenting on map design for CTF in this particular informational. One of my biggest complaints about maps for TS is an improper number of routes between sides. In basically every UT map, teams start on opposite sides of the map and there is a limited amount of routes between your spawn and the enemies spawn. These routes generally include "choke points" which are areas where it tightens up and the teams tend to become more carefull on either side before moving through them. The timing of the two sides needs to be balanced so that both sides reach the choke points at roughly the same time from the spawn. More importantly then the timing is the sheer number of the routes, and the ease of using them. To be honest I'm tired of routes with doors or very small doorways. I am all in favor of losing a bit of realism if it means ease of gameplay. Doors/small doorways in Urban Terror at choke points are a constant nuisance for a couple reasons - the enemy can open and close the door while sitting to the side creating a standoff and more importantly when a door is made it is generally made to scale. A door made to scale means a narrow and not very tall opening for a choke point. The narrower and shorter the choke point access point, the more it will be difficult for the player to move through. Especially large groups of players attempting to rush all at once. This promotes more camping in my opinion - which is something TS does not need to have emphasized through this type of map design. With Abbey and Casa you notice that there is not one swinging door, and all the doorframes are easy to move quickly through - while some of the doors in Streets and Swim can be a nuisance by yourself, let alone with other people. There is a sort of "frustration factor" when you as a player keep having to navigate tight doorways and hallways. 1-2 routes or 354,655,213,234 routes. I feel I cannot stress this enough, so here it is in black and white: More then 2 major routes in a map, as many as possible separated by either distance or cover/buildings to provide enough routes for TS. No more then 5 major routes or you generally end up with a maze where the last two people keep going in circles trying to find each other for the last minutes of the round. As opposed to CTF gameplay which can be complicated if necessary, TS gameplay is quite simple. It is very important to remember this when designing your map layout. There is a balance of too many things happening, too many doors, interior areas, nooks and crannys. One of my biggest complaints about TS map design as it relates to layout is the inclusion of too many "room" areas within the greater layout. 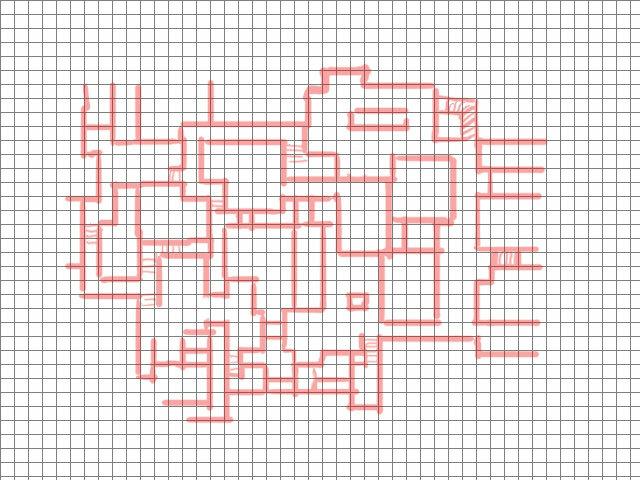 If you create an all indoor map, consider limiting access to all extraneous rooms, meaning bathrooms, closets, rooms not in line with a route, etc. Think about why is a room accessable. If it is not on the way to a major route, or a major route itself (remember the 3-5 rule from above), then do not include it. If you create an outdoor map, consider not including indoor areas at all, or only those that follow the rule of being a route or on the way to a route. Make sure these areas are not too tight to move around in and do not have smallish doors. The idea is to fake reality by including doors/windows/elevators in the map - but not to allow access to every area. One way to think about layout is in terms of a grid. Mapping in GtkRadiant is also on a grid, so the concept fits well within the tools. The idea is to think of a larger grid for the layout, as a basis for the design. 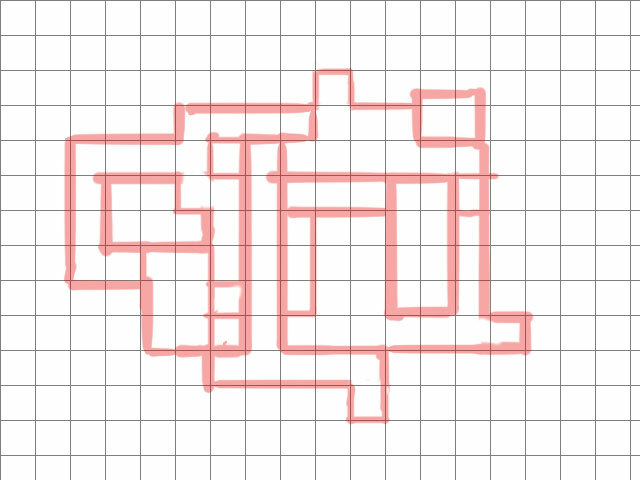 This does not mean the map has to be boxy, because within that grid are finer levels of detail, walls and corners, etc. An example is below, you can see how I started with a grid and created a simple layout based upon this system. (See picture #3) This design progressed (See picture #4) , and within the larger layout a finer grid system was used to create more detail. It is in this way that you can be assured that you see the big picture. Beyond the detail, boxes, walls and corners is a larger layout that needs to conform to a certain number of routes, and be simple in the manner in which you can get there. Another topic I'd like to hit within the layout is something that WetWired taught me about when I was learning mapping. That is the creation of what he called "action areas." The definition of an action area is simple because it ends up being the areas near the choke points. Such as the market or fountain courtyard in Casa. The important thing to remember about action areas is that you want to make sure each action area has a different feel, a reason for existing. Not just a room with a box in it. Why is that area there, what makes it unique? These are important considerations because in TS you want your players to know exactly where they are on the map. 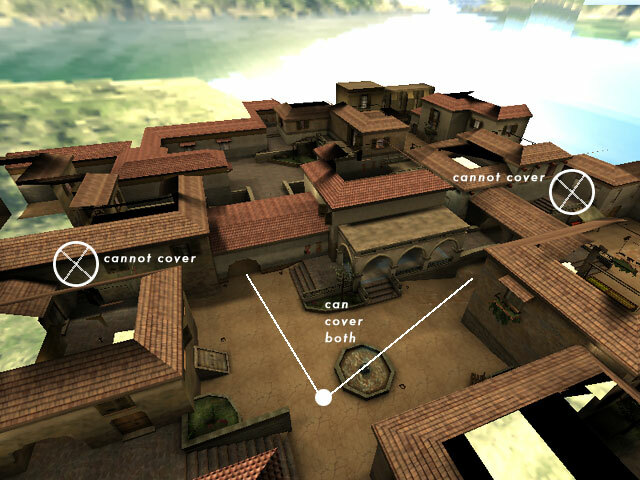 Each action area needs to be instantly recognizeable by the player so in an instant they know where they are. I'd also like to stress that each action area have more then one entrance. As we can see with the 2nd floor camping on the map Village, only one entrance to an area leads to big trouble. As sort of a culmination of the routes/layout theories, it is important to know that the goals of TS mapping are this: achieve multiple routed maps that have simple routes and simple action areas, on a small sized map that each team has opportunities to flank the enemy. This is the core of good TS maps. You need to know where the enemy will come from to a certain level, but when there are only two routes or even worse one such as Laneway - you know TOO much about where the enemy will come from. The routes and layouts must work together to provide enough options so that camping is not as prevalent and not too many options so that the map is an un-navigable maze of tight doors/halls with too many accessable areas that people get frustrated to play. It is also important to remember about elevation change. Not all maps should be perfectly flat, even Casa has minor elevation changes. Elevation changes are needed for TS maps, but too much elevation can easily become a bad thing. The elevation changes need to be balanced across the spawns so that one team does not always have the height advantage. If they are unbalanced, this leads to horrible camping as one can see in the 2.3-2.5 Uptown. And maps as tall as Streets really do not work well for TS. If I had to guess I would say maps in the Casa-Docks elevation range is the most appropriate for TS. - Put the detail within the simple layout, the good textures, the finer brushwork. - Maps with flanking ability. - Make sure you can't see all the routes from one spot. - Think carefully about the theme of action areas. Remember, if you are making CTF maps I am not talking to you. But if you are trying to make TS maps, please really look at the arguments above and give them a shot. I'm sure I'm gona piss people off with this, but to be honest I never cared before and I don't care now. I believe I am right....and there are many people in leagues and pubs who will agree. The community is counting on you as mappers, they need you to support them - to support Urban Terror by creating things that will be enjoyed. You can create for yourself all you want, but there comes a time to give back. I'm asking mappers out there to give back. Please e-mail comments to mercjohns@hotmail.com.